The action was started by accident during the afternoon when both sides were watering their horses on the opposite banks of the river Aeson. King Perseus, of Macedon, formed his phalanx in reaction to the resulting small skirmish and attacked across the river. 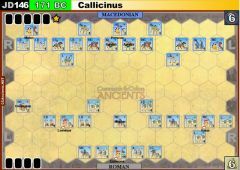 Despite the efforts of the Roman commander, Lucius Aemilus Paulus, son of the Roman consul who died at Cannae in 216 BC, to organize his men, the phalanx swept forward on the flat terrain near the river, but was unable to keep its alignment in the rolling and broken terrain to the south of the initial combat zone. 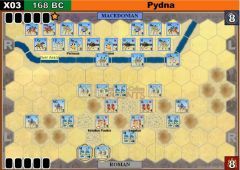 Aemilus counterattacked, taking advantage of gaps that had opened up in the Macedonian phalanx. Once the Romans penetrated the opposing formation the entire phalanx fell apart—Supposedly 20,000 Macedonian troops fell on the field and another 11,000 became captives; only a handful—including Perseus escaped. Roman losses by contrast were put by the annals at under 1,000. Perseus later surrendered and died as a prisoner of the Romans in Italy. The decisive Battle of Pydna marked the end of the Macedonian kingdom, shortly afterwards the entire kingdom was divided by the Romans into four separate so-called “republics”, all of them virtual Roman protectorates. *Note: The date of the battle is known to us from an eclipse of the moon the night before the battle. This was an omen the Romans considered favorable, it caused dismay among the Macedonians. 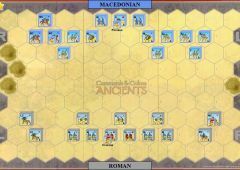 The Macedonian Player moves twice at the start of the game before the Roman Player takes his first move. The Players than take alternate turns as normal for the remainder of the game. 1) All Macedonian Heavy Infantry are considered to be Phalanx Infantry. Phalanx Infantry operates under a set of special rules as follows in a) through e) below. an extra (+1) dice if both of the involved opposing units are in clear hex with no terrain tile present. This is both for any initial Close Combat Attack, and also when Battling Back (but see exception in d) below). The bonus does not apply to any Momentum Combat. b) Phalanx Infantry cannot utilize “double time” Movement or Order activation per the Double Time card. Phalanx Infantry may not be ordered at all by play of a Double Time Card. 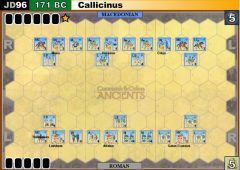 c) Phalanx Infantry may not engage in Close Combat if they have just moved before combat their maximum of one hex, unless the move was into one of the two hexes toward their “front” (i.e. : “front” as in towards the initial setup position of the opposing army) of the moving Phalanx Infantry unit, and that moving Phalanx unit than proceeds to engage in close combat with an enemy unit in one of its “front” two hexes in the new hex it moved to. Phalanx Infantry may engage in normal Momentum Movement and Momentum Combat regardless of the direction of the combat—although without the Phalanx Clear terrain Combat bonus if involved in Momentum Combat (see a) above). Note: Non-moving Ordered Phalanx units may always engage in Close Combat. d) Phalanx infantry units that “Battle Back” at enemy units located in hexes other than the “front hexes” roll a maximum of three dice (and even this could be reduced further by terrain factors). e) Phalanx Infantry units located in clear terrain that also still have three or four blocks on map at the start of the close-combat or battle back ignore the first sword hit inflicted on them by an enemy unit attacking or battling back from a “front” hex. This advantage is also granted in any Momentum Combat. Example of “Front” hexes: A Phalanx Infantry unit in hex H6 would have the following two hexes adjacent: G6 & G7 as its “front” hexes. 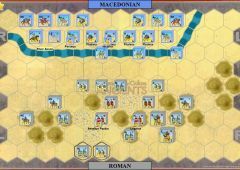 2) The Line Movement Card may only be utilized to move a maximum of 8 linked infantry units and their attached leader(s) (neither side in this unplanned and almost accidental battle were exactly arrayed, although the Macedonian side launched the first effective push of the fight). 3) Roman Auxilia Units may attempt to evade if attacked by a Macedonian Phalanx unit. In this case they evade exactly like any other green light infantry unit. 4) A Leader attached (stacked with) a friendly unit may cancel one sword hit on the unit in lieu of canceling a retreat hit. 5) A unit involved in close combat with the support of a Leader may only count one helmet hit amongst those rolled to inflict a hit on an opposing unit. 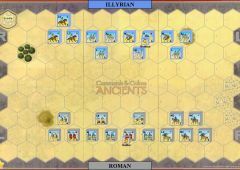 6) The two fortified Roman Camp hexes only benefit the Roman player—if these hexes are entered by Macedonian units the first Macedonian unit to enter the hex loses one block (as men split off to loot) immediately, and the fortified camp tile is removed from the map—thereby converting the hex to clear. 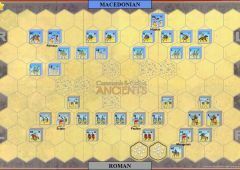 Each camp tile so removed scores the Macedonian Player one banner towards victory.